It was a bright morning as students started to gather at the Keep from 0700 hours. 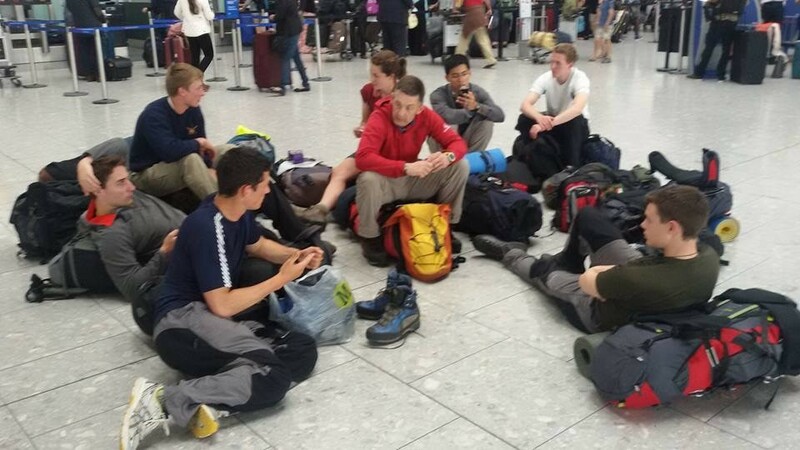 Final administration of passport checks, personal insurance and EHIC’s were being carried out when it became apparent that one of the students expedition rucksack’s that had been posted to them by their family, wasn’t actually a 70 litre rucksack, it was a daysack! Not to be outwitted at this early stage, a replacement was sorted so they could pack their kit. However, when the nominal roll was taken it was identified that one of our brethren wasn’t present. No messages of their late arrival had been received and attempts to contact them had failed. Keen not to abandon their team mate, students quickly volunteered to drive to the absentee’s address as they lived locally, but to no avail, they could not be found. The journey time had been compromised by over 1 hour when we finally got on our way. With pickups on route to the airport whilst driving a vehicle limited to 60 mph, we realised that time was going to be tight. We pushed on dauntlessly, keeping one eye on the clock and an ear to the traffic updates. All seemed positive on our final approach to the airport when the fuel gauge warning light sprung to life. The driver pulled off at the services only to find the one time filling station now masquerading as a one stop car wash! The decision was made to push on as it was 35 miles to the airport services and we had 45 miles of fuel left in the tank…Or so we thought. The automatic safety cut off engaged 1 mile before the airport slip road and we came to a halt on the M11. With the kind assistance of the highways agency we pulled up at the departure drop off to find the check in closed, despite the valiant efforts of some of our waiting team members who had been negotiating at the desk. Collectively we discussed our options and put the team to task. Within the hour we had identified a flight (no mean feat for 19 pax) and overnight accommodation as the flight wasn’t until the following day. A night spent in transit accommodation at RAF Halton had us up early and on the road to Luton airport and finally Heathrow before the flight was confirmed and seats booked. Sadly, 3 of the team members made the decision to withdraw from the expedition at this point, not wishing to pay the additional expense of the flight. This was quickly followed by our 3rd instructor who realised he was not required for ratio purposes. So down to a band 14, we boarded our flight with the loss of one our cultural days only. On reflection it was a massive regain from where we had been the day before and a good lesson for the potential officers and subalterns in not giving up when the odds seem unfairly stacked against you. Somewhat dishevelled we were met by Mr Florin Bana and his coach driver in the early hours of Wednesday morning at Bucharest international airport. The 3 hour coach ride up into the mountains of Transylvania was done in sleepy silence before being ushered to our bed at Hostel Brasov. The hostel was clean tidy and welcoming and a few hours of sleep were snatched before we were up and at it with a busy morning of administration. The team broke into groups to buy maps, cooking fuel and food. The outdoor shops in Brasov have all that is required for trekkers and the supermarkets are well stocked with provisions. The mission of course was to buy food of the right nutritional value which is easy to cook and carry, which the team managed to do surprisingly well. With a quick goodbye to Florin and the lovely Saxon town of Brasov we were bused out to our start point for the trek. The aim was to reach a mountain cabana some six miles away and a 1000 m in height gain and with heavy packs it was more than enough for our first day. The afternoon weather was not too hot and we were in the shade for the forest for most of the journey. The camping area was a welcome stopover with terrific views of the ridgeline that awaited us the following day. The Fagras ridge stretches some 70 km (West to East) along the Southern Carpathian Mountains and are known as the Transylvanian Alps. They contain 8 of Romania’s highest peaks, providing challenging trekking for those wishing to undertake the traverse self-sufficiently. Most tourist use the Cabana’s for shelter and food and move in light scales across the mountains. 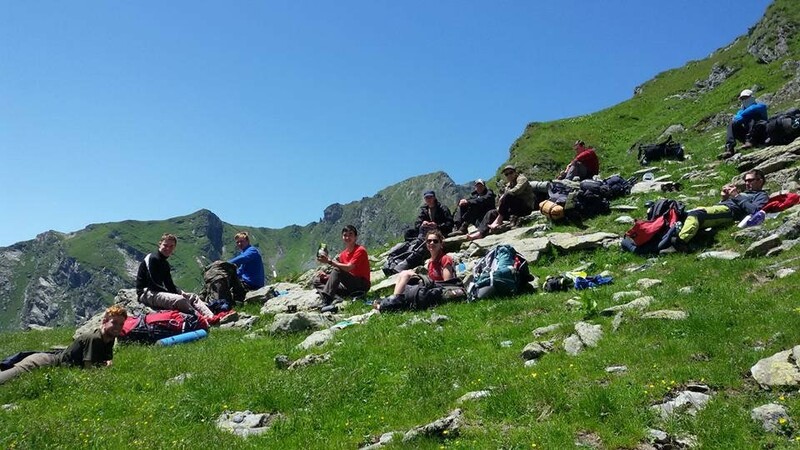 A hard slog in morning sunshine brought us onto the ridge for lunch, averaging at 2200m water is found in only certain places and you generally have to drop off the limestone ridge to find it. A telephone call to Florin, our in-country agent, gave warning of an incoming thunderstorm that evening, so battening down the hatches and keeping the personal administration to a high standard were going to be the order of the night. Thankfully our Terra Nova Quasar tents were able to withstand the gusty battering and the ridgeline bore the brunt of the electrical discharges which seemed to be all round us at times. As the storm passed over we settled down for the rest of the night. For most of the next day the storm clouds never seemed too far away. The morning was spent ascending Romania’s highest peak, Mt Moldoveanu (2545 m), before getting a timely reminder of how the ridgelines are so exposed when a bolt of lightning arced across the sky at 45 degrees to strike the ridge in front of us, prompting heavily laden legs to walk very quickly to lower and safer ground. At water sources you would often find the mountain cabanas, situated just of the ridge and in the higher valleys. Open to customers only after the winter snows have cleared, they are supplied by mule trains bringing all of the required stores up into the high mountains. 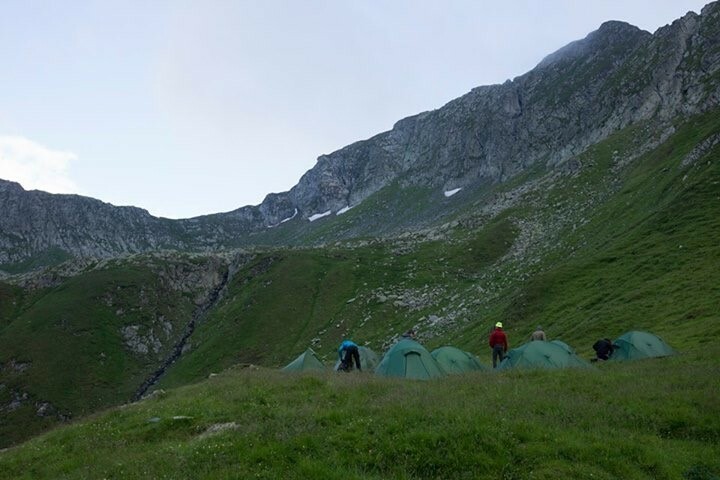 The evening of day 5 brought us off the ridge and down to a camping spot close to Podragu chalet. After the evening lectures had taken place, it was an opportunity to drop down and meet with some fellow hikers and testy our limited Romanian. Not much English is spoken by the older generation so a lot of miming and blank looks were the order of the evening. Day 6 brought us to the fabled “Three Steps to Death” part of the ridgeline walk. Not too much of an eye opener by this point as there had been a lot of exposed areas of path already. Nothing technical though and all the group members were well accustomed to spotting each other on rocky steps by then. The worst of the weather was behind us now and the fine Alpine mountain air and spectacular views were impressing the team. 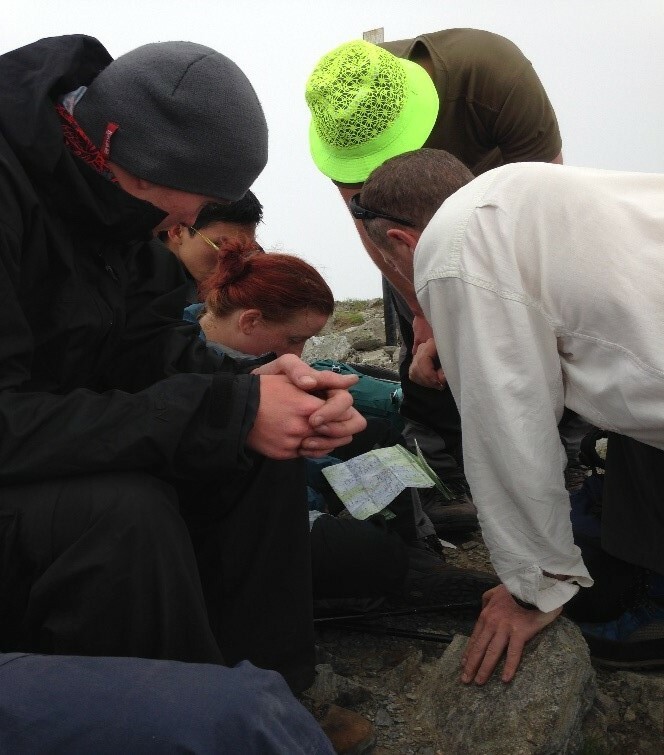 The group were split into two teams during the trek, each day covering different aspects of the Summer Mountain Foundation syllabus, putting into practice what had been taught or confirming and building on personal mountain knowledge. Personal movement skills were a key practical skill, especially with large expedition packs, but all the students were moving with confidence at this stage. Each day an hour would be given up for a leisurely lunch, providing an opportunity to get the stoves out and cook up some of the vast quantities of cuscus that were being carried. The girls in the team had by this stage become surrogate mums, making hot drinks for the rest of the group at the lunchtime stop as some of the boys had managed to set fire to the their stove making it unserviceable. It was also an opportunity to eat as much food as possible, or so it seemed. 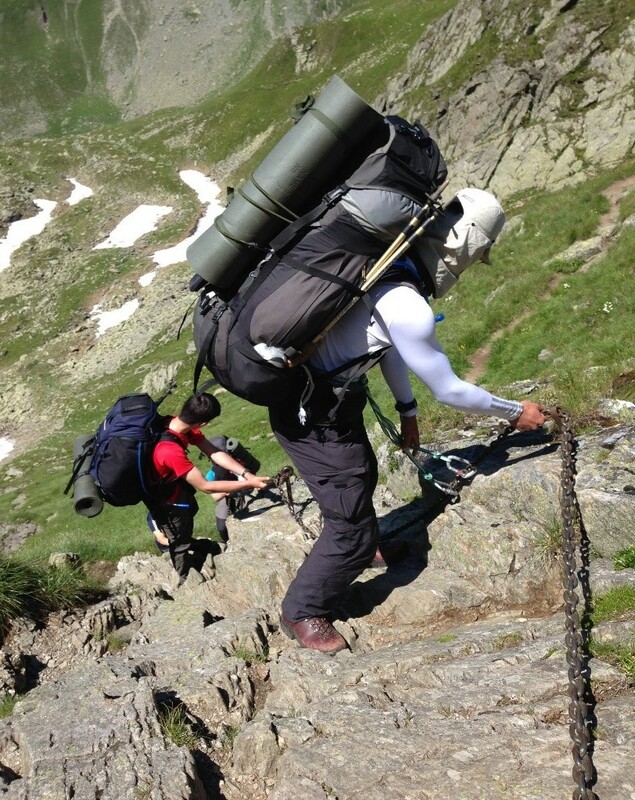 Some of the team were certainly not short on food and any excuse to lighten the rucksack a little was jumped upon. From our vantage points it was easy to spot the flocks of sheep in the valleys below. Moving as one, they swept like a wave or moving blanket across the slopes being guided by the shepherd and his rather large dogs who are much larger than the average dog and not human friendly. This type of grazing is called Transhumance and now only really seen in the alpine regions of the world. 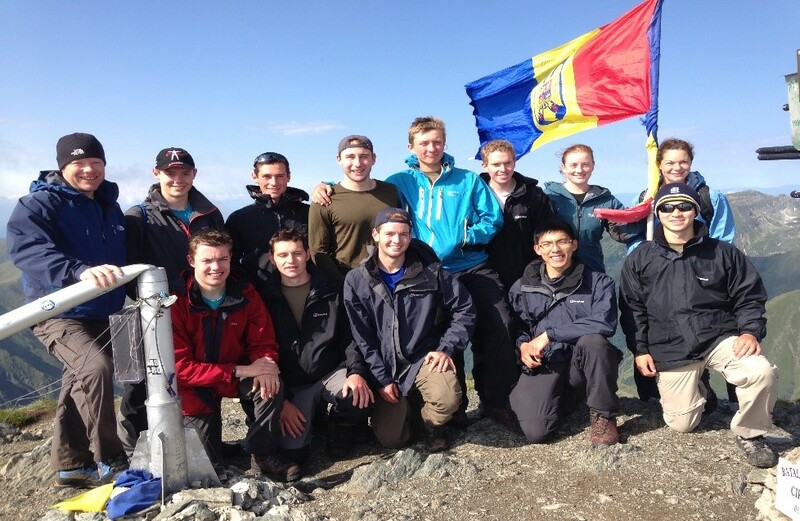 Our final day on the ridgeline (day 8) took us to the second height peak, Mt Negoiu (2535 m). Each day was just as physically challenging as the day before it. Navigation was relatively easy in the good conditions, however the map contour intervals were only indicated every 100m in height gain, so you were continually going up and down features that wouldn’t be marked on the map. This made time calculations exceedingly difficult at times, but an excellent teaching point. Salvation was at hand that evening when we descended from the ridgeline to the Negoiu chalet. 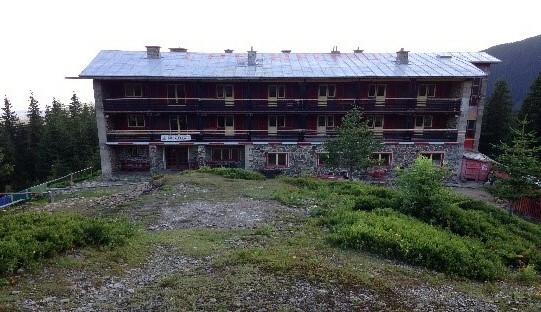 This communist era building looked like it had been made for mountain troops as it had that accommodation block lack of appeal to it, however it provided a bed, food and cold running water on tap, literally just one at the end of the corridor on each floor. As the forests of Romania have a reputation for black bears, our tired party were very happy to use the frugal delights of the chalet before the final walk out of the mountains. With assurance from Florin, the in-country agent, that our transport would be waiting for us when we got off the mountain, we still had 3 valleys to cross and a descent of over a mile to content with. Everyone was ready to go at the stated time and we moved as a collective. 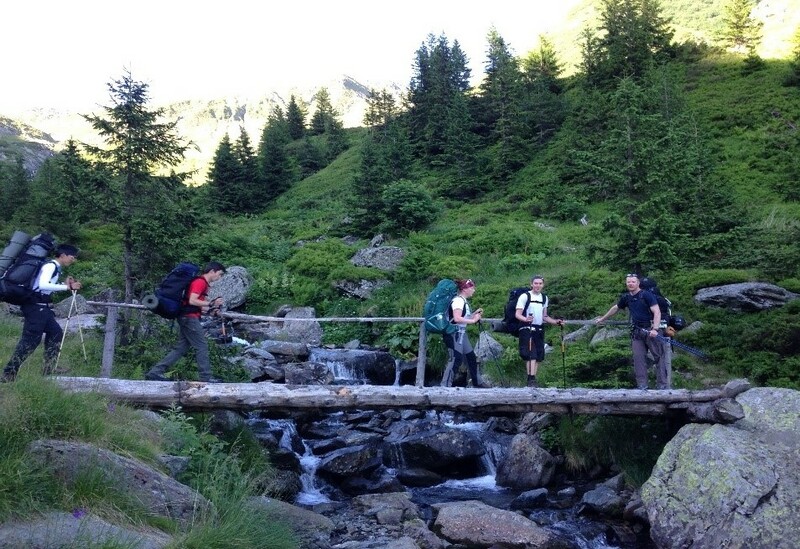 Spirits were high as we said goodbye to the cabana owners and set off through the forested slopes. The path however became clogged with debris from logging until we were negotiating a changed landscape, where roads had suddenly appeared and any trace of our previous route had been eradicated. Thankfully the mountains don’t get moved so easily and we used the larger natural features to take us the last few kilometres to the pick- up point. On time and still smiling we waited for our bus to turn up. We didn’t have to wait long and were soon passing through small villages with horse drawn carts and families in the fields using pitch forks and scythes for cutting the hay. Very rustic indeed. All was about to change in the village of Sebesul de Sus. On the edge of the village, the largest house was owned by Vlad and his wife Maria. Together they run a guest house with an excellent reputation for hospitality and they never disappoint. After a welcome drink of schnapps, a not so light lunch was followed by food and more food to the delight of the team. The rooms were all en-suite and of a high standard, a real treat when you haven’t showered in a week. With full bellies and an evening of merriment, the team headed off to bed. Our last full day in Romania was an opportunity to see some cultural aspects and Sibiu (city of culture 2005) was our destination. Our bus driver took the team to the Dumbrava Cultural Museum 5km outside of Sibiu as our first stop. It had old buildings taken from the four corners of Romania, taken down and reconstructed in one place for the delight of tourists. Farmsteads, watermills, churches, windmills, all hundreds of years old. Unfortunately we only had a couple of hours to take in the sites before heading off to Sibiu. The old Saxon town of Sibiu has a chocolate box feel to it, with castle walls and impressive open squares. 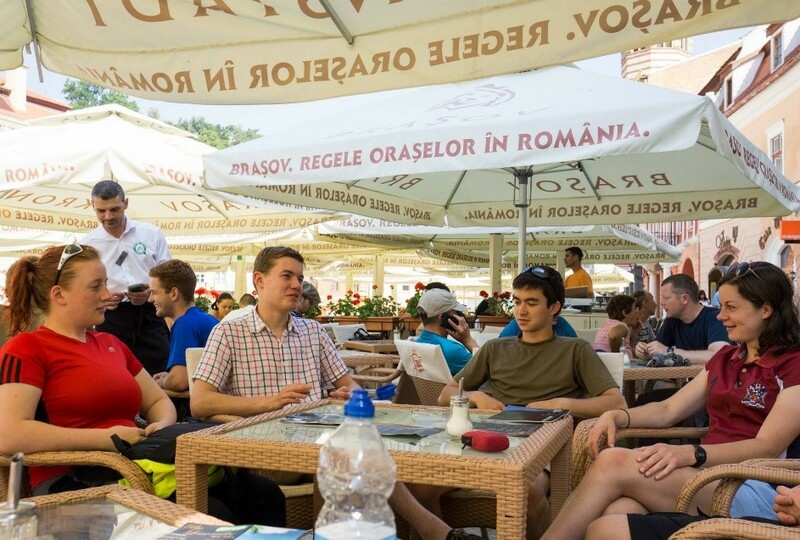 The good weather and café culture feel, mixed with museums and X Games motocross events meant there was lots going on with not enough time to soak it all up before heading back to Vlad’s guest house for tea. A 0400 hours start meant that the 5 five hour journey to Bucharest would get us to the airport good time for our noon flight to Stansted. We made good time all the way to Bucharest but hit gridlock on the city limits. Our route took us right through the city and visions of our missed outbound flight came flooding back! Thankfully we got there with time to spare but you could see our Romanian bus driver was getting pretty stressed. His use of a trucker’s radio net helped us to avoid the cities real traffic black spots and get to the terminal. Having checked in, we were informed of a delay which put us back a couple of hours UK side. Transport to Newcastle was waiting for us as we exited the terminal. Half the team made their own way from there so a combi van was used for the homeward journey. With all souls accounted for and kit handed in for loan pool return, a very successful expedition was had by all that participated. It certainly had that element of “stretch” to it and firmly ticked the box for adventurous training.